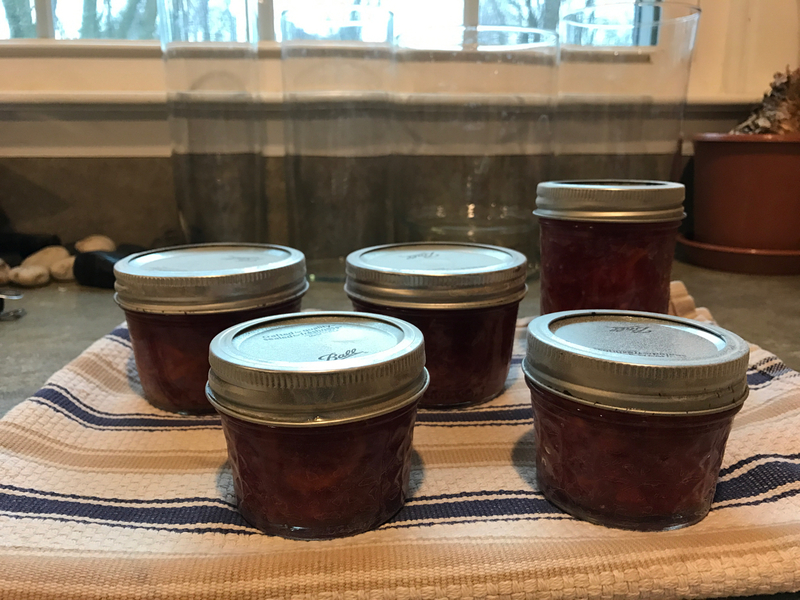 So after a great start to 2017, I totally fell off the wagon—both for blogging and for canning. 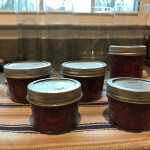 The canning challenges for the second half of 2017 just didn’t inspire me, so I let those slide and did canning projects that interested me (e.g., peach-sriracha jam, pickled scapes, cranberry-raspberry jam). In August we had reunions with two of the kids (and their families) with whom my daughter had become good friends at the CISV Village she attended in July 2016—one from Canada and one from Italy. We plan to see the Canadian next August, too, and we just found out that one of the kids from the Philippines delegation will be on the East Coast in June or July, so we hope to see her too. I’m not one to make New Year’s resolutions, but one goal I do have for this year is to do more sewing. To do that, I need to set up a sewing space that isn’t a small table shoved against the wall next to the washing machine in the basement laundry room. But with encouragement from a friend who’s done a fair amount of awesome sewing herself, I hope to tackle zippers for the first time. Wish me luck! 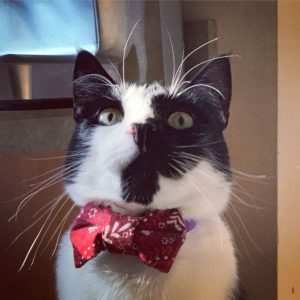 Comments Off on Happy 2018! 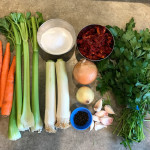 I competed my June entry for the Food in Jars Mastery Challenge a couple of weeks ago. But then I got slammed with finishing-my-work-assignments-before-going-out-of-town, and then I did the actual going-out-of-town. 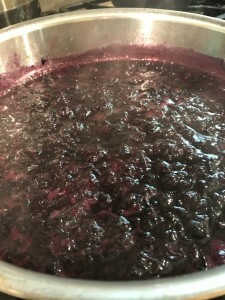 I am home now, and just in time to post about the jam I made! 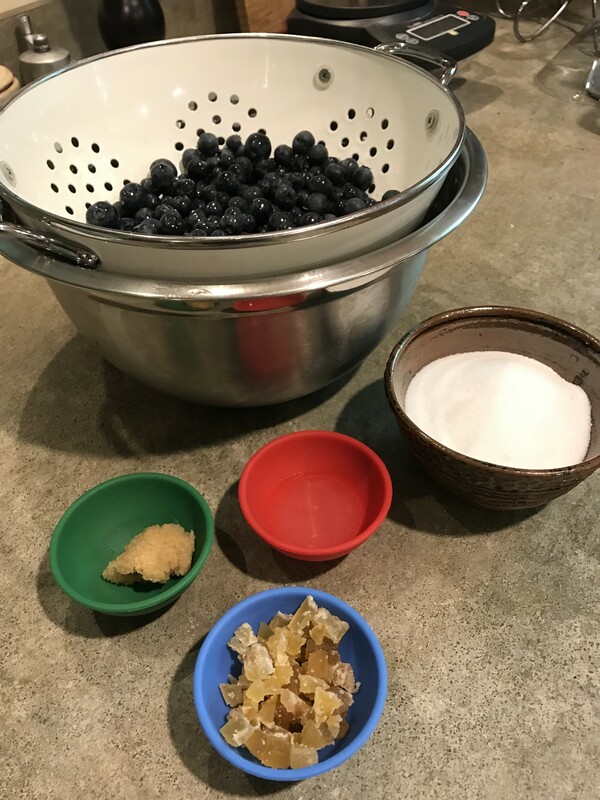 Because I had some delicious blueberries on hand and was curious to find out how well they’d play with ginger, I opted to try the recipe for blueberry jam with crystallized ginger that’s in Marisa’s Preserving by the Pint. The recipe yields two half-pint jars, but I had enough blueberries to fill three. So I did some math and adjusted all of the other ingredients accordingly. Fortunately, my failure to read the recipe through carefully did not wreck my jam! Instead of the end product having little nuggets of crystallized ginger in it, it has ginger “punches” that are more subtle and more evenly distributed—which I think I prefer. P.S. 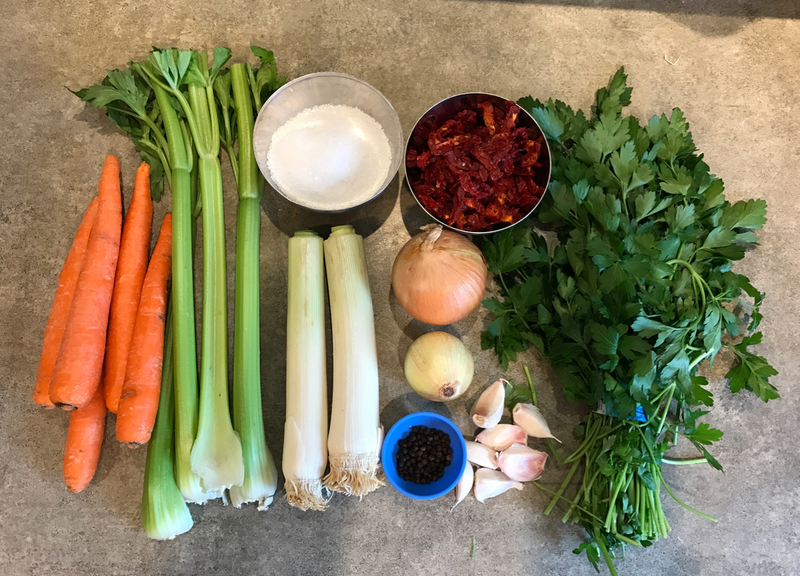 Last month, I wrote, “When scapes appear at my market next month, I plan to try making pickled garlic scapes.” And I did! I look forward to enjoying these when scape season is long over. When scapes appear at my market next month, I plan to try making pickled garlic scapes. I may also try making garlic dill pickles when cucumbers arrive later in the summer. For now, though, I don’t have a lot of work with. 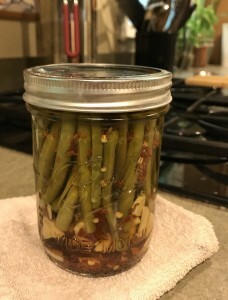 So I decided to give green beans (I found some decent ones at the supermarket—not nearly as good as just-picked local ones, but they aren’t bad) a try as Spicy Pickled Green Beans. I chose this recipe for several reasons: I like green beans. I could find decent green beans at this time of year. And a good friend of mine is nuts for dilly beans. I quartered the recipe and made only one pint jar of these beans, just to give this a try. I will give this jar to my friend and get her opinion. If she pronounces these beans a success, then I’ll try this again (in larger quantities!) when the local beans are here later this summer! Month four of the Food in Jars Mastery Challenge: quick pickles. I’m really glad Marisa chose this theme for April, because I’m not sure I could have managed anything more complicated this month. I wanted to make not just a quick pickle but a super quick pickle. Quick-pickled red onions fit the bill. 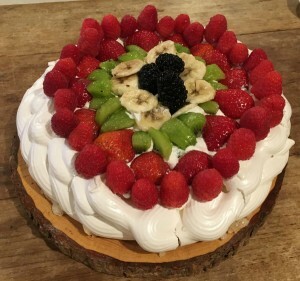 I used this recipe from the Kitchn website as a starting point. 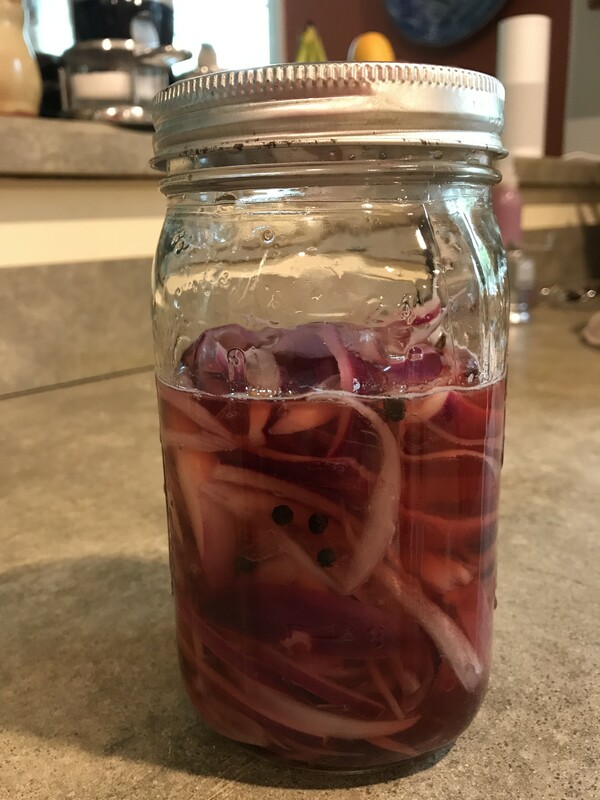 Having read somewhere that using red wine vinegar did the best job of preserving the onions’ red color, I subbed in red wine vinegar for the other varieties suggested in this recipe. All together, it took me about ten minutes to put together a big jar of these pickled onions. They are suberb in falafel sandwiches (that’s where I first encountered them, at Bitar’s in Philadelphia), and I look forward to trying them in tacos and other dishes. The theme for month three of the 2017 Food in Jars Mastery Challenge is “Jellies and shrubs.” I’ve been experimenting with shrubs since last summer, so I would have been happy to venture into new territory with this month’s effort. But my family is not super keen on jelly: we very much prefer that our fruit-based spreads have chunks of fruit in them. 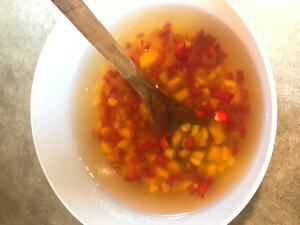 Maybe one day I will play around with jellies (maybe some with delicate floral flavors), but for now I wanted to make something that I knew would be consumed and enjoyed: Pineapple and Red Pepper Shrub. 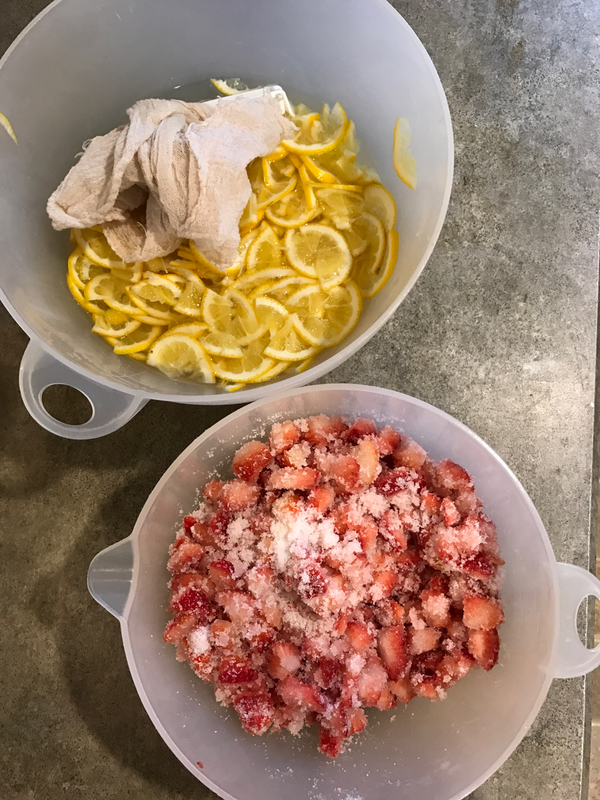 I started with Michael Dietsch’s basic recipe for cold-processed shrubs, which calls for 1:1:1 ratios of fruit, sugar, and vinegar. 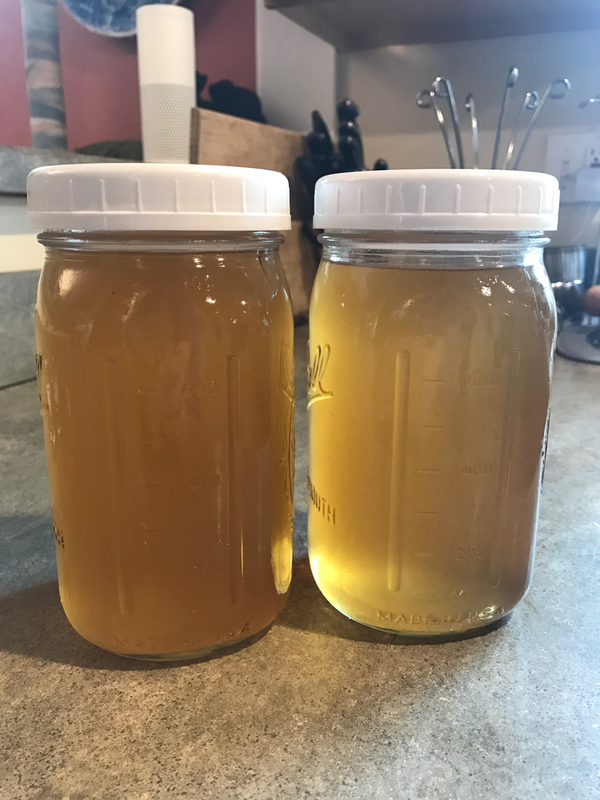 Rather than make a small batch that would be gone before I knew it, I decided to go all in and make enough to last a while. First, I measured out 2 cups of diced pineapple and 2 cups of diced red pepper. 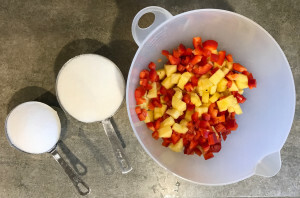 In Dietsch’s recipe, these 4 cups of produce are matched with 4 cups of sugar. 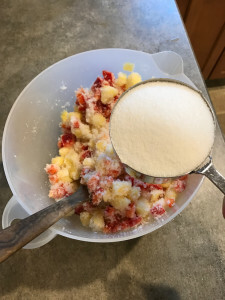 When I measured out 3 cups of sugar, I was somewhat horrified to see just how much that was, so I decided to start with that amount and add more as needed. After stirring in the 3 cups, though, the fruit didn’t seem very well coated with sugar, so I ended up adding in the fourth cup after all (and reminding myself that only a very small amount of sugar ends up in each beverage). I mixed everything up thoroughly, snapped a lip onto the bowl, and put the whole thing in the refrigerator. 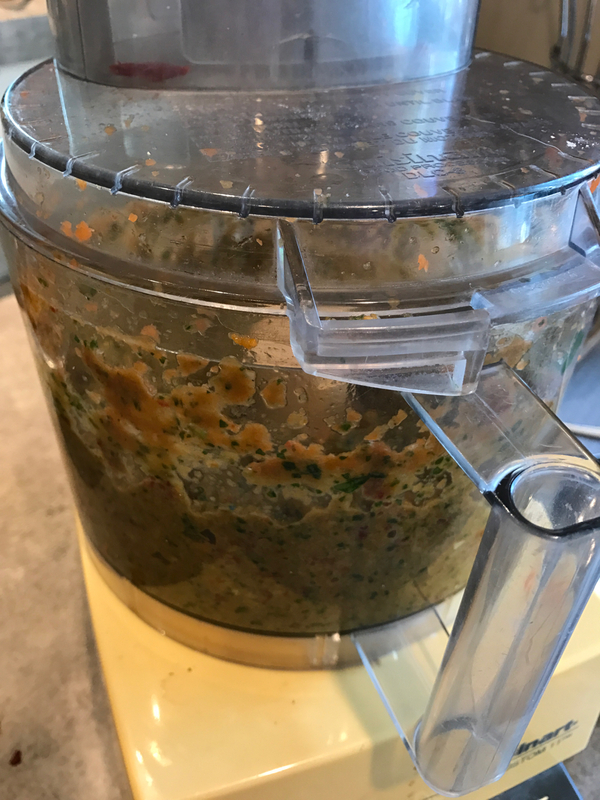 The next day, I worked on it a bit with a potato masher (which in my house is never actually used for potatoes—those go in a ricer) to encourage more of the juice to come out. Pineapple is somewhat juicy, but red pepper doesn’t release nearly the same amount of liquid. So the sugar mixture had a consistency that was more pastelike than syrupy. One day later I took the bowl out of the fridge and stirred it up again. The sugar was still pastelike, though, and I was worried that when I strained the mixture I’d end up leaving a lot of the sugar behind. 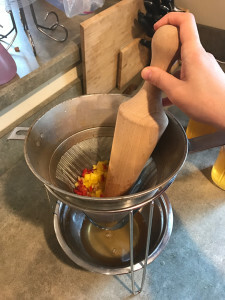 So instead of adding the vinegar after straining per Dietsch’s instructions, I added it at this point so it could help dissolve the sugar and carry it along into the final product. 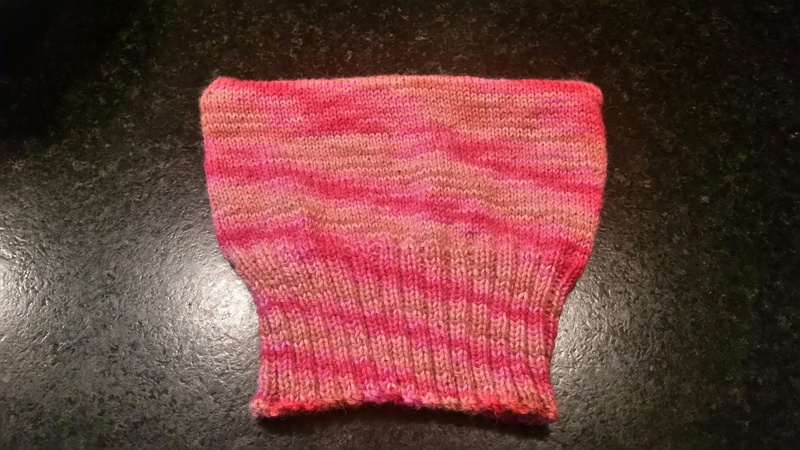 I used apple cider vinegar, which has mellower edges than white vinegar. Then it was time to strain the mixture. For this, I turned to our chinois. (A chinois is a ridiculously overpriced piece of kitchen equipment. After making do with other sieves, strainers, and cheesecloth for years, we finally broke down and bought a chinois two years ago. We use ours all the time [best way to strain yogurt!] and wish we’d gotten this sooner.) 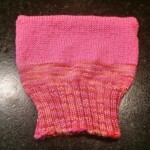 Its very fine mesh ensures that no solids get through. And the wooden cone-shaped pestle that comes with it is just fantastic at pressing out the last bits of liquid—in this case, at least a full cup of liquid that would have otherwise been lost to the compost bin. 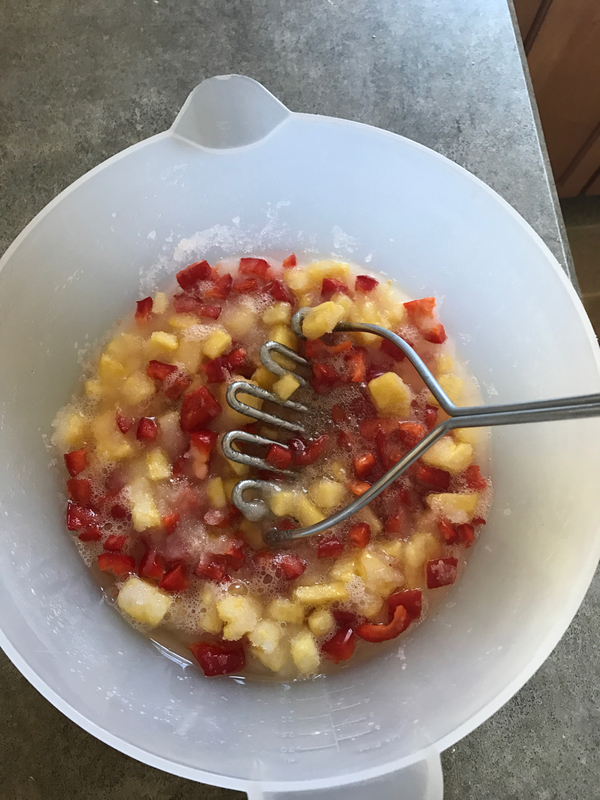 This recipe yielded two quarts of pineapple-and-red-pepper shrub. I like to add about 4 Tb of shrub to a tall glass of seltzer. Any less, and the flavor (especially the red pepper) is a bit too faint; any more, and the drink is just too piquant. This is an amazingly refreshing beverage on a hot day! I’ve been busy since the last time I updated my blog: work (I helped two of my editorial clients publish new books! ), travel (camping in May, our annual trip to Vermont in August), and volunteering (in addition to my long-term involvement with Amnesty International, I’m now on the board for my local CISV chapter). 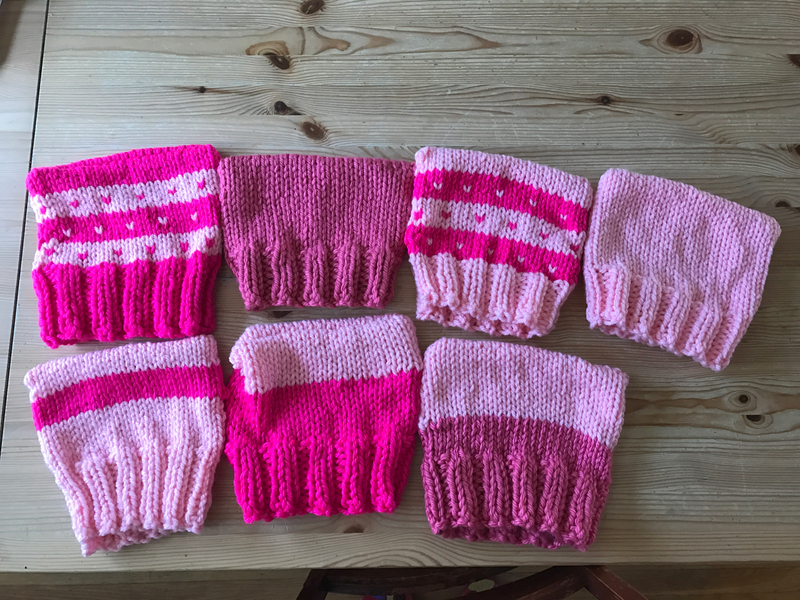 I’ve also done a lot of knitting (which I’ll write about another time) and a lot of canning (which I’ll write about now). In the fall of 2015 I scored a few boxes of Roma tomatoes from a local farmer. 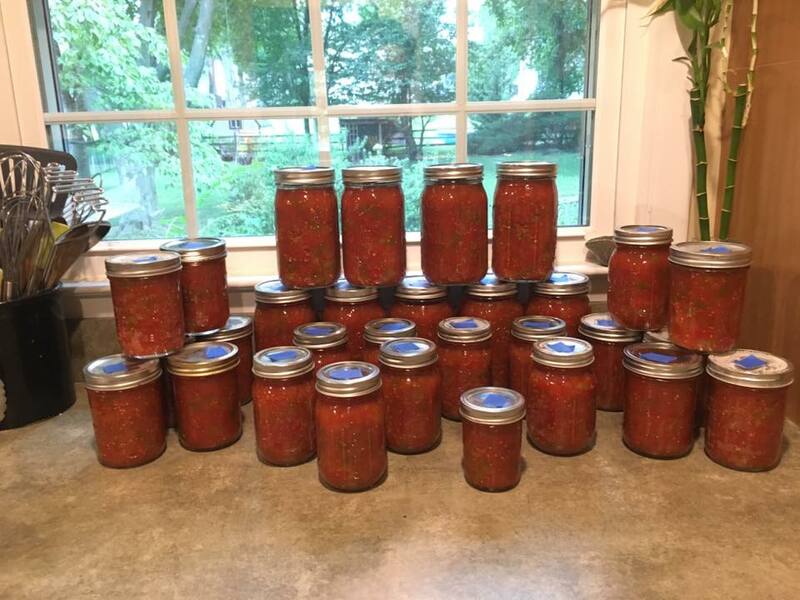 I turned one-third of them into canned whole tomatoes (the perfect blank slate on which to build during the tomato-deficient winter months), one-third into a salsa from Food in Jars, and one-third into “Mailman Salsa” (so named because our mail carrier, Mark, gave us the recipe). 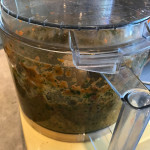 Mailman Salsa was such a hit with my family (my usually tomato-hating kid loved it) that last fall, when I managed to acquire forty pounds of local Roma tomatoes, I turned them all into Mailman Salsa—over five gallons of it. 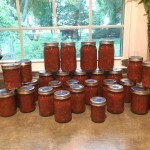 I’m pretty comfortable with my salsa-making skills but less confident in other canning domains. So when Marisa announced early this month that she’d be running a “Food in Jars Mastery Challenge” during 2017, I signed up immediately. 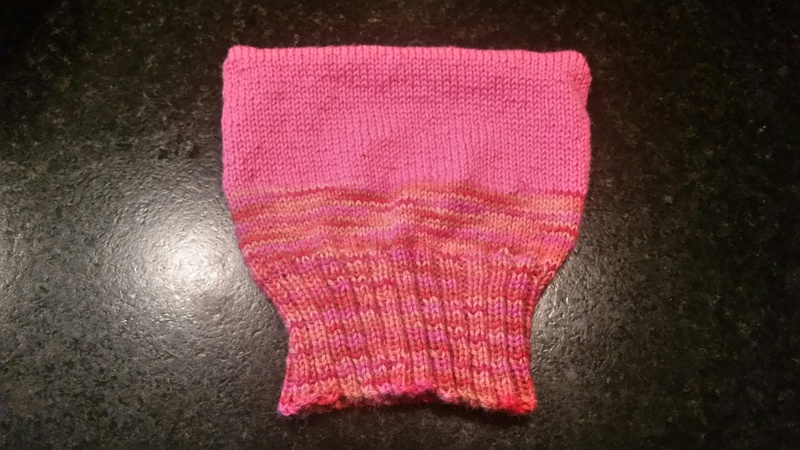 Here’s my chance, I thought, I push myself out of my canning comfort zone and try something new. January’s assignment got things off with a bang: marmalade. I have sampled marmalade a few times in my life and haven’t enjoyed it (even though, after reading the Paddington Bear books, I really wanted to). It was always orange marmalade, and it was always yucky (to me, at least). So I wasn’t terribly keen on making marmalade. But I didn’t want to fail the challenge right at the start! Fortunately, Meyer lemons are in season right now—and very nice ones are available at my grocery store. 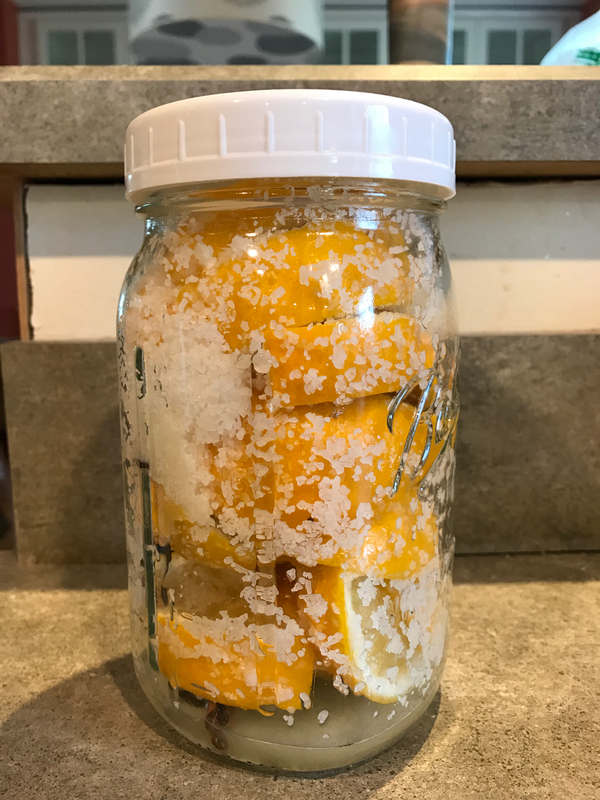 Marisa has waxed rhapsodic about Meyer lemons both in her blog and in her books, so I decided to see what all the fuss is about. 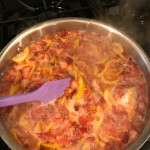 A few days ago, I tackled her Strawberry Meyer Lemon Marmalade in Preserving by the Pint. 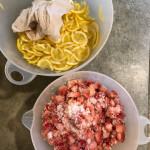 First, I prepped the fruit. This took some time (partly because I am the current holder of the World’s Slowest Knife Skills in the Kitchen award). 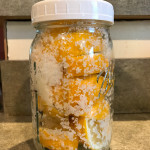 Putting the lemon’s white core and seeds in cheesecloth and extracting their pectin by adding that bundle to the soaking lemon slices is a really nifty idea. Food chemistry ftw! Then I cooked the fruit until it lost a lost of liquid and hit 200 degrees on my cooking thermometer. And then I processed the jars in a water bath for ten minutes. The recipe yield is three half pints, and I hit that pretty much right on the head. 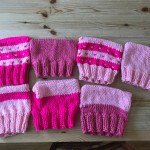 (I had only two half-pint jars, not three, so I substituted two half-cup jars for the third.) See that nice white powder on my jars? Oh, the joy of living in a place with super-hard water! 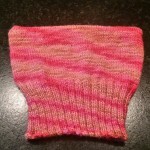 But I am pleased with the results! The marmalade tastes pretty good. The brightness of the strawberry tempers some of the “pointiness” (I don’t really know how else to describe it) of the lemon. My jars all set up nicely (hooray!). 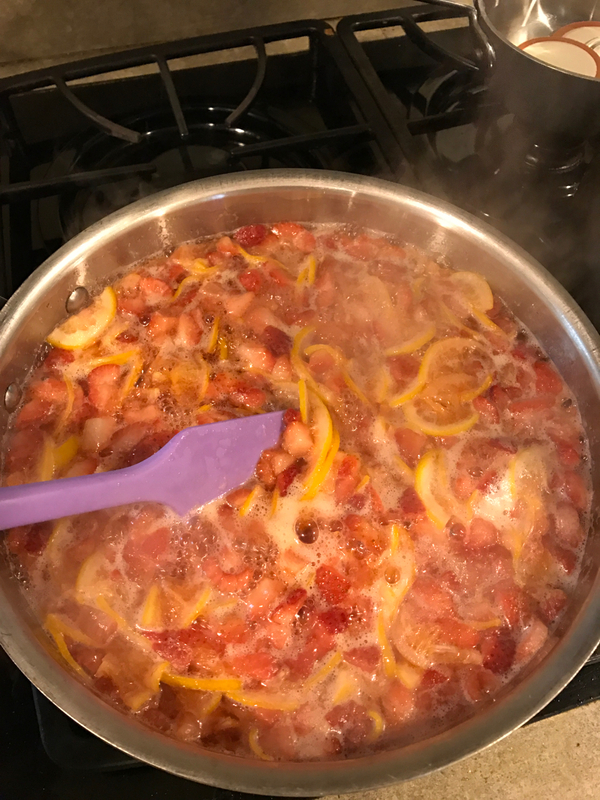 I’m not sure if I’ll be making a lot more marmalade in my future (that will depend on how much my family likes this), but I’m glad I’ve finally done it at least once.